Poll: What do to you think about this card? Join the discussion on our forums! Come discuss Rat Pack over in our dedicated Rat Pack discussion topic. Dinomancy will raise victorious where the Grimy Goons failed. Goodness, and I thought Infested Wolf was a good card. This blows it straight out of the water. It's actually a good card,the meta is just too fast for hunters. If you went back 1 year in time and told someone "meta will be too fast for hunters" they would laugh their asses off. Strange times we're in. I still don't think this card is weak. It's probably more of the fact that there's no handbuff hunters atm/ handbuff hunter is weak compared to other decktypes. Absolutely phenomenal card, this is everything that Infested Wolf should've been; more powerful and curves naturally into Houndmaster. 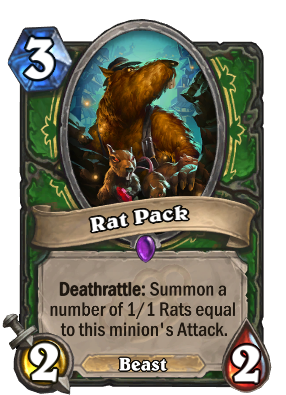 Getting 4 Rats from Rat Pack is routine, and a massive headache for your opponent. 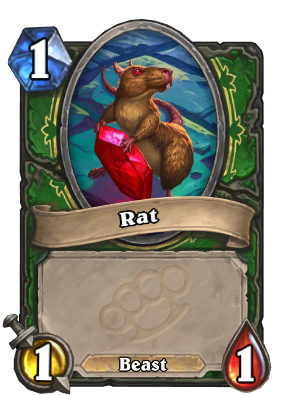 I'm guessing this is an homage to Pack Rat from MTG. It too used to flood the board with rats and was quite popular in its time.